Cantilever arms are used to handle any kind of object. These ready-made, hot plunged roused steel cantilever arms with 14 mm thickness holes provide a fast and simple method of sustaining compressing entities on outside barriers. These are accessible in a straight length and webbed version in a range of lengths. 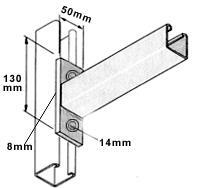 The strut dimensions are 41 mm x 41 mm x 2.5 mm. Less price barrier mounting selection. Extant in straight lengths and webbed versions. Strut dimensions are 41 mm x 41 mm x 2.5 mm. Accessible in 750mm straight lengths. Approaches full with 2.5 x 750mm lengths of strut. All barrier and a/c unit fittings supplied.